President expects to increase tariffs in 2019. Stocks are reversing some of yesterday’s healthy gains following a Wall Street Journal interview with President Trump during which he said it’s “highly unlikely” that the U.S. will hold off on increasing tariffs on $200 billion of Chinese imports to 25% (from 10%) if negotiations with Chinese President Xi Jinping at the G20 summit later this week don’t produce a favorable outcome for the U.S. Despite officials from both sides having been in talks for weeks, expectations for a deal to be reached this week remain low. 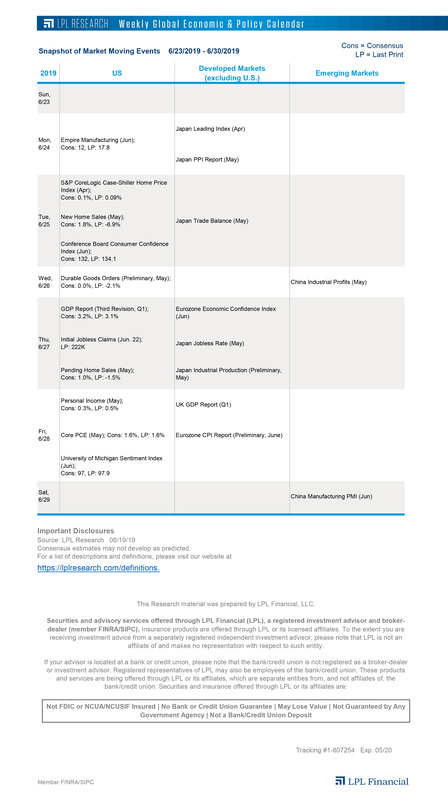 However, a significant majority of S&P 500 Index companies have indicated in third quarter conference calls that the impact from tariffs has been limited thus far (see this week’s Weekly Market Commentary), supported by the fact that the ~$500 billion of Chinese goods imported annually represents a small fraction of the U.S. economy. Treasury yields pick up despite drop in inflation expectations. After snapping a nine-day streak of declines, the benchmark 10-year Treasury yield inched higher by 2 basis points yesterday ahead of a series of Treasury auctions of various maturities throughout the week. The increase in supply is buoying yields despite declining market-based inflation expectations to below 2% over the next 10 years. Some of the key drivers of the recent decline in longer-term inflation forecasts can be attributed to the oil’s precipitous fall over the past month, concerns that geopolitical turmoil may be starting to weigh on global growth, and the Federal Reserve’s determination to continue its rate-hike campaign in the face of contrasting market forecasts. High yield credit spreads continuing higher. High yield (HY) credit spreads, as measured by Bloomberg Barclays US Corporate HY Average OAS Index, remain above 4% after breeching that level on November 15 for the first time since April 2017. While our outlook for the U.S. economy, and by extension the corporate credit market, remains positive, we remain neutral on the HY segment of the fixed income market given its asymmetrical risk profile. In other words, when spreads widen, the pace tends to be faster than when they tighten, indicating greater downside risk than upside potential, particularly at current levels, and as we move later into the cycle that downside risk increases. However, increasing yields and an overall healthy U.S. economy still support allocations for appropriate investors seeking income. Why own bonds? Investors just endured their second correction in U.S. stocks this year, in which the 10-year yield posted its biggest three-week slide since April 2017. In today’s LPL Research blog, we explain the appeal of ownings bonds as a hedge for stock-market volatility, even in a rising rate environment. LPL Market Signals Podcast. In our latest episode, listen to LPL Financial Chief Investment Strategist John Lynch and Senior Market Strategist Ryan Detrick discuss turkeys, crude oil prices, stressed credit markets, and Brexit. We will also be taking a break this week from our regular recording schedule due to the Thanksgiving holiday. Please tune in the next week when we will return to our normal recording schedule. We hope you had a Happy Thanksgiving. Subscribe to the free Market Signals podcast series on iTunes, Google Play, Spotify, or wherever you get your podcasts! All company names noted herein are for educational purposes only and not an indication of trading intent or a solitication of their products or services. LPL Financial doesn’t provide research on individual equities.